New to the market, this traditional home in Silver Lake is where modern sophistication meets classic charm. This urban estate meets today's lifestyle needs by featuring high-end retro finishes, fully automated smart-home system equipped with Nest, automated door locks and customizable lighting in every room. The interior boasts beautiful hand distressed French White Oak floors and vaulted ceilings. Carrera marble countertops, vintage Viking appliances and custom hand tiled hood are just a few of the many details you will enjoy in the sky-lit chef's galley kitchen. 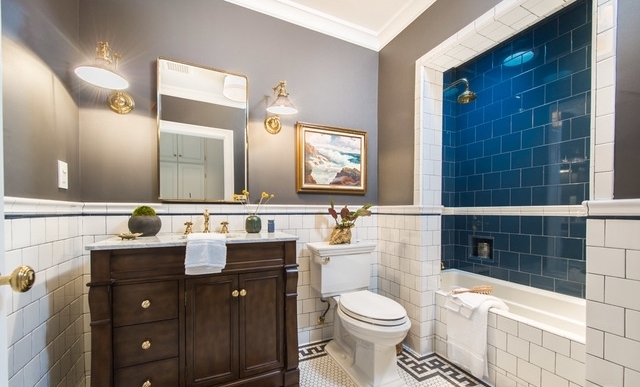 Bathrooms are beautifully done with hand laid mosaic tile and equipped with full soaking tubs. Beautifully designed landscaping includes lush English gardens with fruit trees, inspiring 40 foot pine trees and soothing water feature. Click HERE for more information.